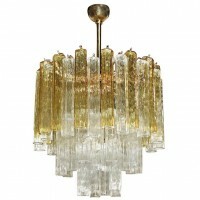 Exceptional Venini chandelier with amber and clear hexagonal glass tubes beautifully displayed on a brass plated steel frame. Newly wired. Total height including ceiling cap 37″.